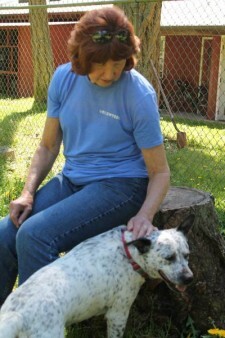 The Animal Protection Society of Friday Harbor has announced that Louise Deacon is the Volunteer of the Month for April. Louise can be counted on to show up at the animal shelter every Wednesday to help out with any job she’s asked to do. Louise does mountains of laundry, cuddles cats and walks dogs, in addition to lots of other important tasks around the facility. Louise is a favorite of all the dogs and cats at the shelter because she takes the time to pay attention to each and every one of them during her volunteer time. Volunteers like Louise make a huge difference in the lives of shelter animals and we appreciate their time and compassion so much! If you’d like to join the volunteer team at the animal shelter, contact Stephanie Zamora at 378-2158.